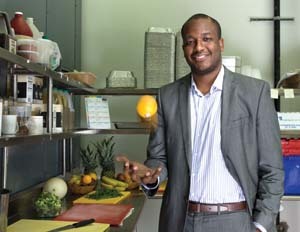 The Harlem-based business cooks from scratch; packages; and delivers breakfast, lunch, and snacks to public, private, and charter schools. But the company avoids processed foods, opting to buy 80% of its produce from local farmers and the rest from local suppliers. In doing so, schools get their choice of health-conscious meals, including pizza on wheat bread, multigrain pancakes, and hard-boiled farm-fresh eggs, among other menu staples. How he made it: Powell shifted his audience from a broad consumer base to schools and educational institutions. Red Rabbit has been able to double annual revenue each year since 2008 by offering meal choices that meet the growing demand of parents and their children at competitive prices for administrators. Rhys W. Powell started Red Rabbit in 2005 with a simple mission: to provide parents with healthy food choices for their children. After a structural revamp and a major shift in target audience, the socially charged company eventually found success providing healthy packaged meals and snacks to schools throughout New York and New Jersey. Red Rabbit is an alternative to the traditional food service vendors contracted out by schools. The Harlem-based business cooks from scratch; packages; and delivers breakfast, lunch, and snacks to public, private, and charter schools. But the company avoids processed foods, opting to buy 80% of its produce from local farmers and the rest from local suppliers. In doing so, schools get their choice of health-conscious meals, including pizza on wheat bread, multigrain pancakes, and hard-boiled farm-fresh eggs, among other menu staples. “We used the United States Department of Agriculture guidelines as a starting point and then far exceeded them with the final menu,â€ says Powell. “We worked with nutritionists and pediatricians to set the program’s nutrition philosophy.â€ Powell and his team of 54 employees deliver more than 12,000 healthy meals daily to 70 schools. Each day, 32 million children in the United States get a free or low-cost lunch at schools that participate in the National School Lunch Program, a federally assisted meal program administered under the USDA. However, the U.S. food service contracting industry is dominated by three multinational giants: Aramark, headquartered in Philadelphia; Compass Group North America out of Charlotte, North Carolina; and Sodexo Inc., in Gaithersburg, Maryland, with combined annual revenues of $45.3 billion in 2011. In total, the eight largest food companies hold 75% of school contracts, reports The Cornell Policy Review.